The Toyota RAV4 is one of the most popular compact crossover SUVs produced by the Japanese automobile major Toyota. The vehicle has a seating capacity of five passengers. One of the main highlights of the Toyota RAV4 is its cargo volume which is 38.4 ft³ and 73.4 ft³ with seat area. The SUV is available with both options front wheel drive and all wheel drive. The price of the Toyota RAV4 ranges from $24,350 to $31,510. The main rivals of the Toyota RAV4 are the Honda CR-V, Subaru Forester, Ford Escape and Mazda CX-5. 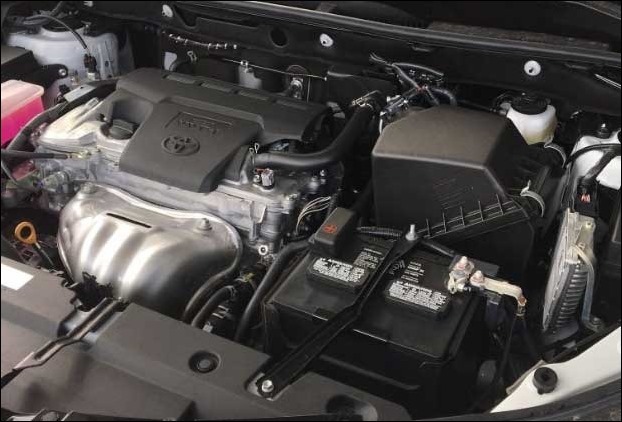 The Toyota RAV4 features a 2.5 liter in-line four cylinder with 176 horsepower. The vehicle has a six speed automatic transmission. 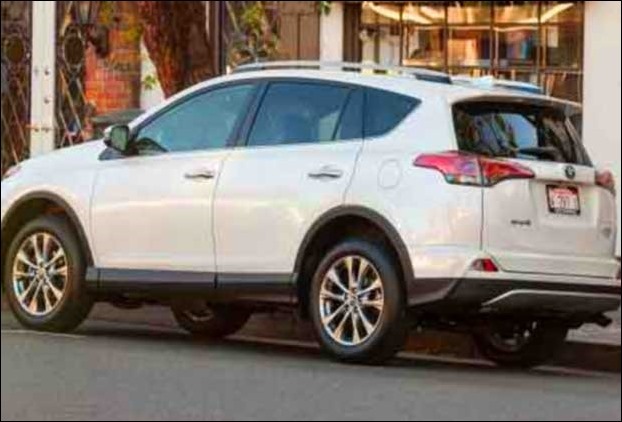 The Toyota RAV4 has a fuel economy of 23 mpg within the city and 30 mpg on the highway. Besides, the vehicle has a fuel tank capacity of 15.9 gal. The Toyota RAV4 features a turning circle of 34.8 ft. The vehicle achieves the 0 – 60 mph time within nine seconds. The Toyota RAV4 has stylish exterior. 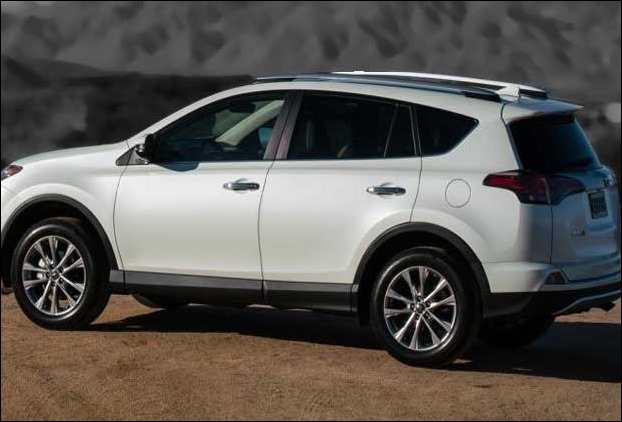 On the plus side, the sleek body shape makes the Toyota RAV4 an aerodynamic SUV. The car is fitted with 18-inch alloy wheels. The SUV comes in eight attractive colours – Barcelona Red Metallic, Electric Storm Blue, Black, Magnetic Gray Metallic, Super White, Black Currant Metallic, Silver Sky Metallic and Hot Lava. 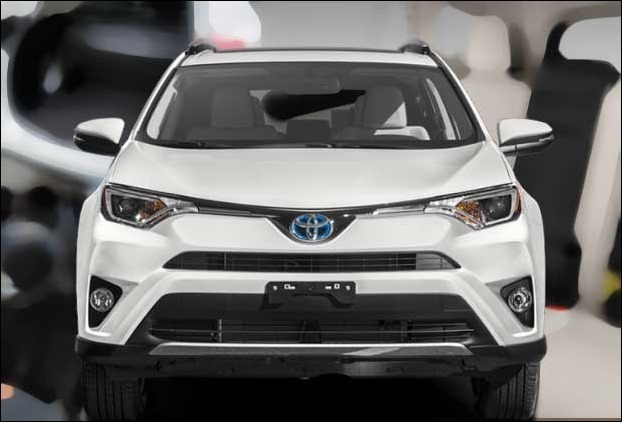 Other attractive features of the Toyota RAV4 include Light Emitting Diode (LED) headlamps, powerful front fog lamps, power back door which opens at just a click of the button on the instrument panel or a touch of the smart key, rain sensing wipers, roof rails and standard size moon roof. In terms of dimension, the Toyota RAV4 measures 15 ft. 1.1 in. or 181.1 inches in length, 6 ft. 0.6 in. or 72.6 inches in width and 5 ft. 7.1 in. or 67.1 inches in height. At the same time, the car has a wheel base of 8 ft. 8.7 in. or 104.7 inches and a ground clearance of 6.3 inches. On the inside, the Toyota RAV4 features high quality interiors. 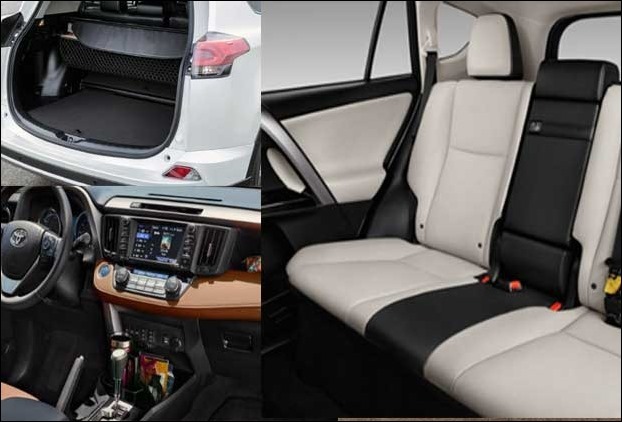 The cabin of the SUV is roomy and pleasant and, at the same time, the quality of plastic is good. In addition, the car gets bucket front seats, height adjustable driver seat, split folding rear seatback, folding center armrest and leather wrapped steering wheel. There are also new sunglasses holder and redesigned cup holders. In terms of convenience and comfort, the Toyota RAV4 comes equipped with cruise control, tilt and telescopic steering wheel, audio and cruise controls on steering wheel, one touch power windows, heated mirrors, remote keyless power door locks, rearview camera, front seatback storage, air conditioning, 12-volt power outlet, dual vanity mirrors and interior air filtration. Apart from these features, the SUV gets 6.1-inch touch screen display, Bluetooth, AM/ FM stereo, six speakers, auxiliary audio input and USB with external media control and USB connection. The Toyota RAV4 is a good performer. The SUV is fitted with four wheel independent suspension and front and rear stabilizer bar. The Toyota RAV4 provides a composed handling and a smooth ride. Moreover, the ventilated front disc and solid rear disc brakes of the car ensure premium braking. In terms of safety, the Toyota RAV4 is packed with a lot of safety features such as dual front side mounted airbags, 4-wheel ABS, daytime running lights, child seat anchors, front and rear head airbags, passenger airbag occupant sensing deactivation, electronic stability control, rear door child safety locks and VIP RS3200 plus security system. Other vital safety features of the Toyota RAV4 include traction control, rear center three point belt, emergency braking assist, lane departure warning, engine immobilizer, tire pressure monitoring, integrated turn signal mirrors, emergency trunk release, rollover protection system, adjustable pedals, front tow hooks, rear tow hooks and first aid kit. The main advantages of the Toyota RAV4 are its abundant cargo volume and good safety features. In fact, the SUV is blessed with almost all essential safety features. The car is very comfortable and spacious. The SUV has also traction control. Furthermore, the Toyota RAV4 boasts excellent sound systems. The major drawback of the Toyota RAV4 is its sluggish transmission. Fuel efficiency of the car is also average. Besides, the touch screen of the SUV is unresponsive. The Toyota RAV4 is a decent SUV. The ride and handling of the car is pleasing too. In addition to these, the Toyota RAV4 has a seating arrangement for five passengers and is endowed with segment leading head room, knee room, leg room and shoulder room. On the plus side, the car has a stylish cabin and adequate cargo volume. Hence, the Toyota RAV4 is absolutely perfect for those who want to buy a premium SUV with high end features. The World’s most popular top 7 Electric Cars at the moment ! Ex Showroom price vs on Road price – What makes so much difference ! First Time Car Buyer ? Prefer to buy with these 6 important features !